It seems new studies come out all the time contradicting each other. 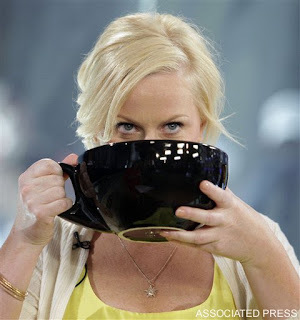 Some say coffee is good for you and helps promote weight loss, others say it’s bad and makes you fat. But a new study just out takes the cake – it says coffee is both good AND bad for you. Thanks, guys. I’m so glad you cleared that up for us. The study of more than 50,000 people, published in the Journal of Headache Pain, found caffeine both causes and prevents headaches. According to the Norwegian scientists, people who drink lots of caffeine every day are more likely to have occasional headaches, while those who consume small amounts of caffeine have chronic headaches, which occur 14 or more days each month. So, if you have occasional headaches you should to try cutting back on the juice, and if you suffer from chronic headaches pop on over to Starbucks and grab a Venti Americano. How much coffee (caffeine) do you drink? Think it has any effect on your headaches? This entry was posted by kate, on Monday, August 17, 2009. You can leave your response . Strong coffee usually gives me a headache which is strange...A lot of people claim that caffeine is supposed to open your blood vessels and help your headache get better.